Double edge safety razors are a traditional tool in wet shaving. They developed from the straight razor, allowing men to shave safely at home rather than going to the barbers. We now have a huge choice when it comes to shaving tools, including cartridge and electric shavers — so why are safety razors still such a popular choice for men and women? The English Shaving Company is an expert in traditional shaving, including safety razors, and have advice on why swapping to the DE safety razor is a fantastic choice, not just for your skin, but also for the environment. Double edge safety razors were developed as a way for the average man to shave at home, without having to make trips out to the barbers for a clean and close shave, or trying to master the difficult straight razor. DE safety razors got their name as they were a safer, more consumer-friendly alternative to the straight razor. It has a blade that’s held in a fixed position between two pieces of metal. It not only keep the blade in place, but also controls the ‘aggression’ of the razor: the level of possible contact with the blade which varies between open comb (more aggressive) and closed comb (less aggressive). Safety razors are an increasingly popular choice because, put simply, they work. The single blade is extremely sharp and therefore effective in cutting the hairs very close the base, beneath the skin, to produce a shave that’s closer than can be achieved with cartridge razors. A common technique is a three-pass shave. This involves shaving with the grain, then across and then against, allowing you to catch all the hair and results in an extremely close shave. You can control the closeness of your shave by reducing the number of passes, but even one pass with the safety razor will result in a clean finish. Because there is only one blade, many men and women experience less razor burn and shaving rash than with other shaving methods — although a lot of this will also be down to skin preparation and aftercare. With a multi-blade cartridge razor, the first blade removes the shaving cream and the following blades then move against the skin without lubricant, resulting in irritation and ingrown hairs. Safety razors are not only a great choice for your skin, but they are also a fantastic choice for your wallet. They are the cheapest way to shave. The razor itself comes with an initial cost that can vary upwards from £15, but it will then last for years. To keep the razor sharp, the blade needs to be replaced every few shaves — depending on your shaving routine, the thickness of your hair and the way your store your razor. Replacement blades for DE razors are the cheapest on the market. Even premium blades cost around 40p per blade, while normal ones are usually 20p per blade. Awareness of the environment has soared recently with more and more people trying to make lifestyle changes to reduce plastic waste and their environmental impact. 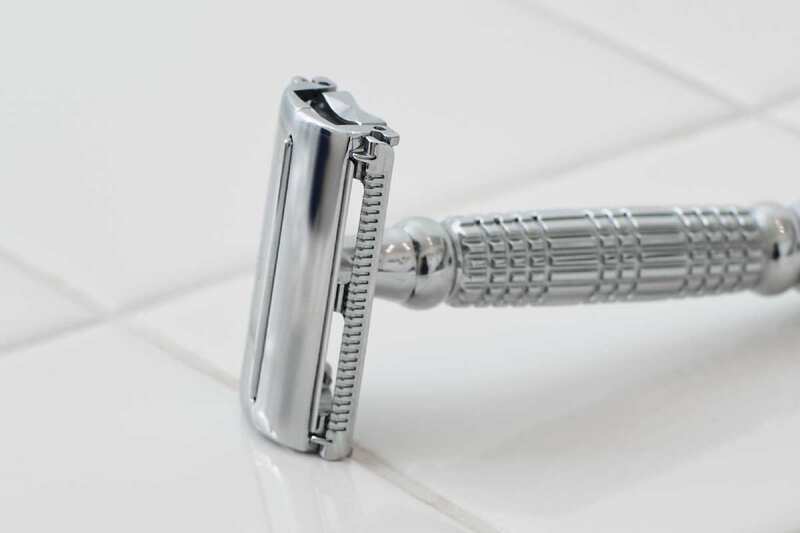 This has lead to an increase in safety razor popularity, particularly on the women’s market — as women over the last few decades have largely relied on plastic cartridge razors to a greater extent than men. However, both men and women can help the environment by switching to a DE razor. Unlike cartridge razors, most DE safety razors are plastic free. They are made completely of metal (although there are some available with plastic included in the handle), and therefore not only last a long time, but also cut plastic out of your shaving routine. Plastic, depending on the type, takes hundreds of years to break down and as it does so releases chemicals that are harmful to the environment. Plastic is impacting the world’s ecosystem, as well as taking up huge amounts of space. If everyone makes small changes to reduce plastic use, it could go a huge way in improving the world. The replacement blades usually come in cardboard packaging rather than plastic and, as they’re made of metal, can be recycled. You’ll likely have to take them to your local recycling point as it would be dangerous to put them into your normal recycling bin. Even blades you’ve replaced because they’ve become blunt will be extremely sharp! A lot of places that sell safety razor blades will also sell tins in which to dispose of your blades. You can then take them in bulk to your local recycling point. Double edge safety razors are a fantastic way to get a great shave, save money and improve your environmental footprint! If you want more information, The English Shaving Company have a lot of guides and advice on their website, including a guide on choosing the best safety razor for you.